The elegant wood veneer desking from the Global Corby collection is nothing short of impressive. 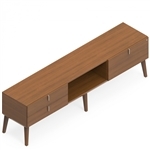 This line of mid century modern office furniture offers an unrivaled combination of luxury and appeal. Corby desks, collaborative tables, and wall cabinets are available individually, and as apart of executive style configurations for upscale office interiors. All Global Corby components are available in more than 10 fashionable veneer finish options. Enjoy the full line of Global Corby furniture with free shipping for added value. Your Price: $1,592.99 + Free Shipping! Your Price: $1,039.99 + Free Shipping! Your Price: $1,011.99 + Free Shipping! Your Price: $1,277.99 + Free Shipping! Your Price: $985.99 + Free Shipping! Your Price: $1,273.99 + Free Shipping! Your Price: $1,196.99 + Free Shipping! Your Price: $1,189.99 + Free Shipping! Your Price: $1,688.99 + Free Shipping! Your Price: $2,471.99 + Free Shipping! Your Price: $3,391.99 + Free Shipping! Your Price: $3,165.99 + Free Shipping! Your Price: $3,007.99 + Free Shipping! Your Price: $2,871.99 + Free Shipping!